In 1996 newly married Eddy Lee and his bride set off to Nashville. It was a move to try his hand at getting into music in the capital of the music business. 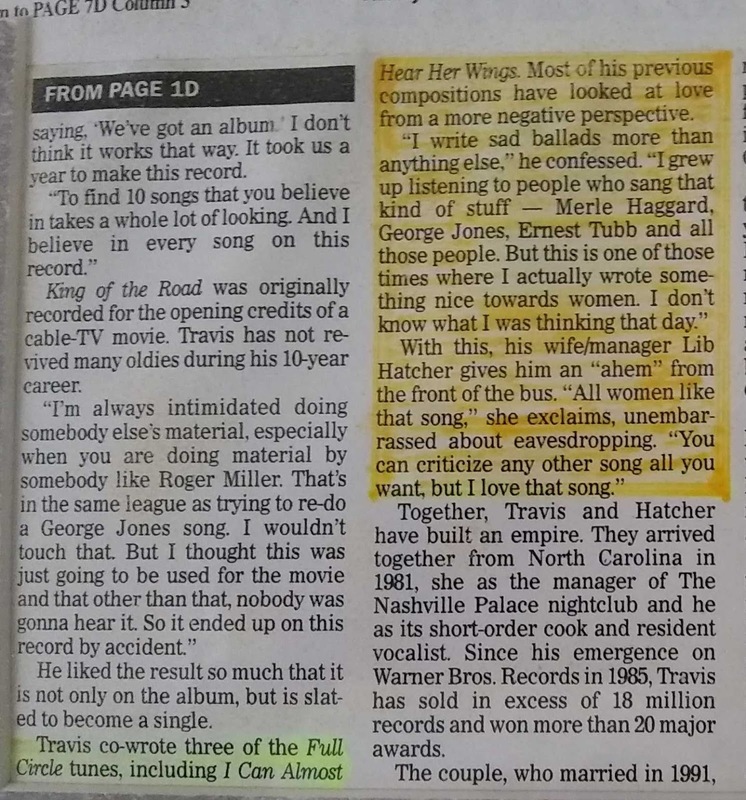 It is very difficult, since Nashville is flooded daily with those with the same music dreams. It was something he had to try. Eddy Lee's goal was to get a cut also known as song recorded. 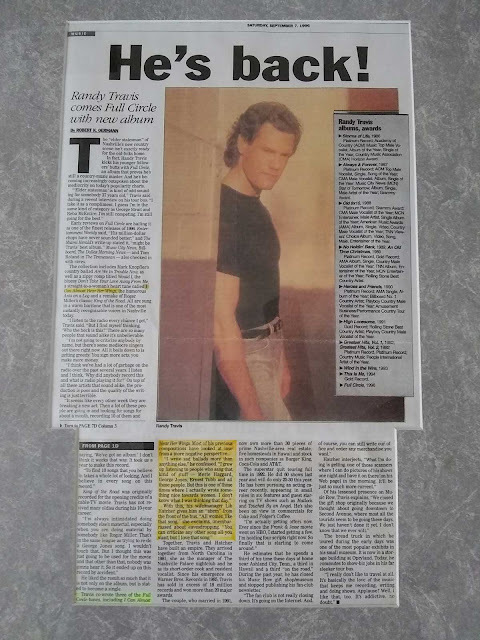 In August 1996 Randy Travis released his "Full Circle" album with the song "I Can Almost Hear Her Wings" which was co-written by Randy Travis, Eddy Lee and Buck Moore*. Track number 11 is the song, which is further down on this post. Eddy Lee never met Randy Travis with Buck Moore managing the project. Eddy Lee called his parents very excited and sang the song over the phone. Eddy Lee made a cassette tape recording for his family. 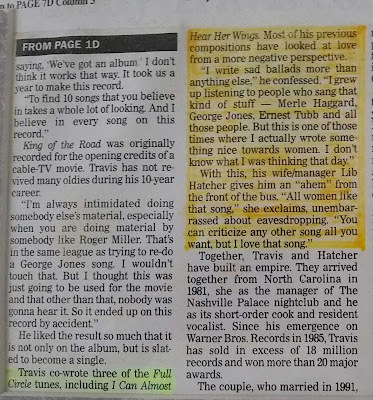 However, Eddy Lee's name was misspelled on Randy Travis's Full Circle Album as Eddie Lee. Survival in Nashville was difficult and he and his bride soon headed home. His goal was met. He never had the desire to return. Click here to listen "I Can Almost Hear Her Wings"
Eddy Lee knew the right people. But as Mentor Williams put it, who wrote the rock and roll classic "Drift Away", in telling Eddy Lee that he (Eddy Lee) "had it", it is luck and timing as what had happened for him (Mentor) with "Drift Away". Another musician, Michael Smith (From Red River. NM) shared with Eddy Lee's parents, "The music is always out there." It just wasn't his time, but he did reach his goal with a recorded song while in Nashville..
* Buck Moore passed away in 2013 (01-03-1934 to 09-23-2013). 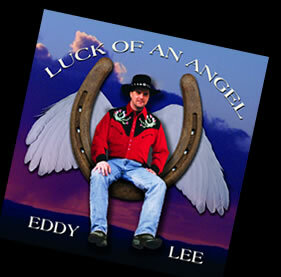 Wiz Allred did the graphics for Eddy Lee's "Luck of an Angel" CD. 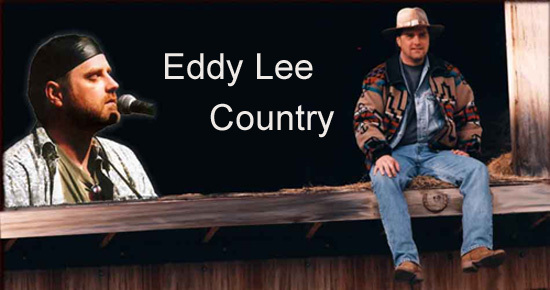 If you noticed the Eddy Lee Country headers located on FACEBOOK and in this blog (below) and compare to the photo of Eddy Lees Luck of an Angel CD (above), you will see it is the same. However, note his boots are black and not brown and his hat is no longer brown, but his original black hat. Of course the horse shoe with the opening towards the top is traditionally the symbol for good luck. The angels wings on the CD were the wings of a live dove. The red shirt Eddy Lee has on the "Luck of an Angel" CD, is the Scully Brand, which Eddy Lee really liked and was adding to his wardrobe. This red shirt is identical to the one he was buried in. Another was purchased and his Dad wore it for the photo and Wiz Allred did his graphic magic. 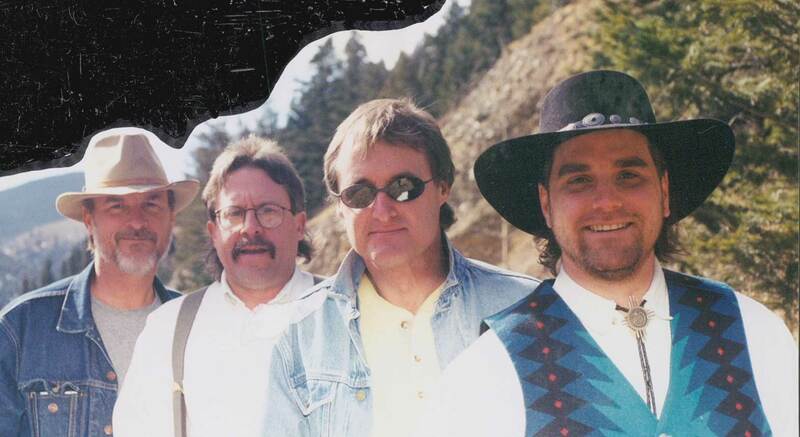 “Aces &Eights”- Rick Fowler (Three Faces West) having picked the name; left to right in the photo above. 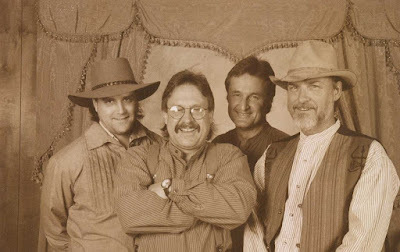 Eddy Lee on bass and guitar, Mark Webernick, key board, Rick Fowler on bass and guitar (he and Eddy Lee would trade off) and Steve Howard on rhythm. Over the years the Bullington family vacationing in Red River stumbled onto this mountain town heading to a cousins wedding in Denver. During their yearly visits they would go to the Outpost where the Three Faces West performed. After 10 years, they moved to Red River. Eddy Lee was to later tell his parents that he decided then that he would be a musician. Eddy Lee was around 7 yrs. old at that time. The Three Faces West members were Rick Fowler, Wayne Kidd, Ray Wiley Hubbard and later Steve Howard. As an adult Eddy Lee was to later play with Rick Fowler, Wayne Kidd and Steve Howard. You would always know how long someone had known Eddy Lee whether they called him Lee or Eddy Lee. Eddy Lee was his professional name. Rick Flower said that Eddy Lee liked that he called him Lee as a long time friend.